Quicksilver has been travelling to Low Isles since 1979 and we have always known it is a special island. In June 2008, Low Isles and its 130 year old lighthouse were formally registered on the Commonwealth Heritage List, in recognition of their place in Australia’s cultural and Indigenous heritage. This is a first for the Great Barrier Reef, and is very significant as it is the first time one location has received a dual listing for both Indigenous history and Australian cultural heritage. 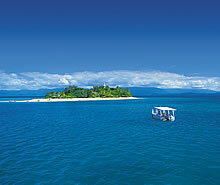 Situated 15km north-east of Port Douglas Low Isles is a 4 acre coral cay surrounded by 55 acres of reef. The corals are very close to the island, which makes snorkelling an enjoyable experience. On the island we erected permanent thatched umberellas for our passengers' comfort. Your experience can be as educational as it is relaxing - many activities are available for your participation. The two small islands are separate with one common reef. The larger of the two, Woody Island, is uninhabited except for a large bird population. It is a vital habitat for many species. A little bit of island history. In 1770 Captain James Cook described Low Isles as a “small low island” and was officially called Low Isles in 1819. The Aboriginal people know these islands as Wungkun. It is an important Indigenous and cultural site for the KuKu Yalanji and Yiragandi people as the sea country for both groups overlaps at Low Isles. Weather data has been gathered from the island since 1887 and the historic lighthouse has been operating since 1878. In 1928 it was the base for the first scientific study of a coral reef anywhere in the world, examining the structure and ecology of the surrounding reef. Many current theories of coral reef ecology are based on the findings of this early expedition. Quicksilver commenced the first daily cruises to Low Isles in 1979 and in 2000, the Low Isles Heritage Walk was officially opened. There are 150 different species of hard corals in the waters surrounding Low Isles, although these are dominated by 15 species of soft corals. If you look closely, the feathery tentacles of soft corals can often be seen collecting tiny food particles from the water around them. Living amongst the corals is a large variety of fish, molluscs, sea cucumbers and other animals. Colourful blue, green and purple parrotfish are a common sight as well as angelfish, damselfish, anenomefish or clownfish, trevally, rabbitfish, sweetlip, moon wrasse and fusiliers, just to name a few! At least seven species of seagrasses grow on the intertidal sandflats of Low Isles, providing a home and food for such animals as sea cucumbers, the attractive spidershell, as well as rays, green turtles and dugongs. The historic, heritage listed lighthouse was completed in 1878 and since then has guided ships through the main shipping channel between Port Douglas and Cairns. The lighthouse’s 18 metre tower was constructed on a timber frame with a galvanised sheath and interestingly, the Low Isles lighthouse was the first in Queensland to have porthole windows. A timber staircase leads to the lantern room. Originally oil burners were used to light the way, but over the years with new technology the lighthouse continued to be upgraded and in 1993 solar conversion made it into a self-contained beacon. The original 1878 lens for the light can today be seen on display in the Court House Museum, Port Douglas. The lightstation is controlled by the Queensland Parks and Wildlife Service.